The 16 oz Ceramic Tumbler is the ideal product for those who love keeping their drinks hot. Looking just like a coffee house to go cup the durable ceramic construction will ensure it can be used visit after visit. With a sophisticated looking leatherette wrap around the circumference of this custom tumbler will add to your grip to your favorite beverage. Work with are design team to create unique artwork for your ceramic tumbler making it stand out from all others. Thanks to our high quality printing process, your ceramic coffee cup will come to you with stunning imprints in a detailed manner. 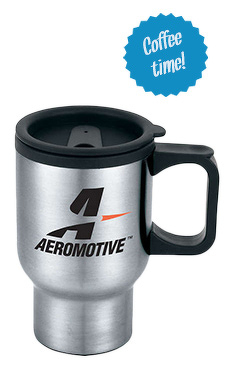 Use your ceramic travel mug in many different forms or events. Use it has an appreciation gift to clients or a thank you gift to company office. Everyone will be grateful you care. They can use it to get coffee as it fits in most automobile cup holders or have hot tea at their desk. Your travel coffee mug holds 16 ounces of liquid in the dependable ceramic housing. Finishing touches include a real leather like wrap that covers all round the travel mug allowing to imprint your favorite message or logo. A spill resistant thumb slide lid tops off your ceramic tumbler for convenience use time after time.